We envision teeth as naturally brilliant. Unfortunately, the reality is darker – quite literally. 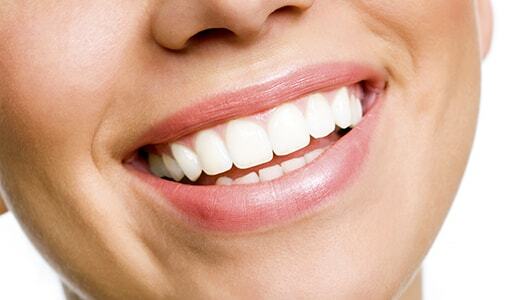 Teeth naturally acquire stains over time, and many other factors contribute to discoloration. Teeth whitening is one of the most requested treatments here at 32 Dental in Kennesaw, and it is a wonderful solution for the vast majority of patients. However, every person is unique. This ideal path to a brilliant smile depends on the cause of tooth discoloration, and your cosmetic goals. Food or beverages – One of the most common, and most difficult to avoid, causes of darkening tooth enamel is stains from the things you consume. Some substances, such a black tea or tomato-based sauces, will discolor teeth more quickly than others. However, virtually anything that you eat or drink may cause some degree of staining. Tobacco – Nicotine, whether from smoking or chewing tobacco, can quickly discolor teeth with yellowish or brownish stains. Lax oral hygiene – When you skip brushing and flossing, you leave bits of food on your teeth, giving plenty of time for stains to set in. Thin enamel – Over time, tooth enamel thins due to normal wear and tear. This may be exacerbated by consumption of acidic foods and beverages, medical conditions causing frequent vomiting, or oral disease. As enamel thins, the darker underlying layer of dentin shows through. Oral injury – In some cases, an impact or other trauma can damage pulp inside of a tooth. If dental pulp dies, it darkens, and it can affect the outward appearance of the tooth. Intrinsic staining – Tooth enamel begins forming within the body, long before the tooth actually emerges. Certain conditions, such as consumption of excess fluoride or taking tetracycline and doxycycline antibiotics during childhood can cause discolored inclusions in the enamel. Old dental work – Amalgam (also called “silver”) has largely fallen out of favor due to its unnatural appearance, as well as its high mercury content. However, it is still used and was once extremely popular. Therefore, many people have amalgam fillings. If you are among them, you might experience grayish-black discoloration of the surrounding tooth. The first line of defense against discoloration is sparkling clean teeth. You’ve probably noticed that your pearly whites are even whiter after a hygiene appointment. That is because professional cleaning removes surface stains and polishes your teeth. A good daily at-home hygiene routine helps maintain the sparkle between appointments. Many toothpastes that are marketed as whitening products contain mild abrasives, which help scrub surface stains from your teeth. These products should be used with caution. If the abrasive is too harsh, or if your tooth enamel is naturally soft, they can be damaging. Talk to your dentist if you are considering using an abrasive whitener. 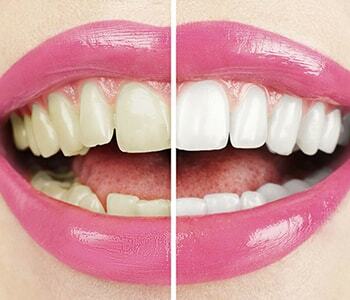 The next level of whitening comes from treatments that actually bleach away stains. Professional whitening is the most popular and effective go-to solution for general staining and discoloration, such as that caused by food or nicotine. Although some over-the-counter products have bleaching ingredients, they lack the power and the safety measures that come with professional treatment. We begin with an examination to ensure that you are a suitable candidate, and then create customized bleaching trays. You will be provided with a gentle-yet-powerful bleaching gel, and complete instructions for use. The actual whitening process is completed in the comfort of your own home, with convenient daily applications. You have control over the result, as you can watch your teeth become lighter each day and cease treatment when you are satisfied, usually after a week or two. You can also perform touch-up applications as needed, because teeth continuously acquire new stains. Tooth bleaching formulas act on natural tooth material. If you have “white” restorations that match your current tooth color, then bleaching may cause the surrounding enamel to be lighter than the restoration. Additionally, amalgam fillings will continue discoloring your teeth as long as they are in place. In these situations, the best solution is usually replacement of old restorations with beautiful, brilliant, cosmetic ones. If your tooth enamel is extremely thin, or your natural tooth color is very dark, then bleaching might not achieve your desired shade of brilliance. Also, in some cases, intrinsic staining cannot be bleached away. Porcelain veneers provide a wonderful, long-lasting solution in these situations. They cover the visible surface with a thin layer of porcelain, which can be colored to your liking. To find out if you are a good candidate for teeth whitening, give us a call at (770) 423-1132 and schedule a consultation.